When habitats are somehow connected, plants and animals can migrate better through the landscape. 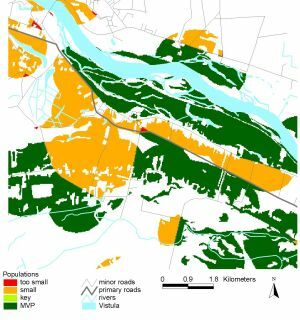 The models LARCH and MNP can be used to evaluate landscape connectivity for plant and animal species in a scattered landscape like the river Rhine delta. 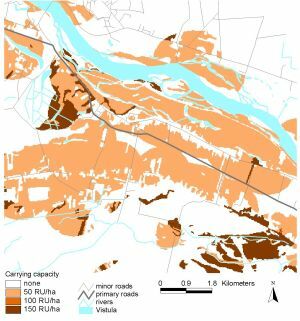 Models are used in relation to nature restoration plans, e.g. for the design of stepping stones, corridors or road overpasses for animals. The models LARCH and MNP are based on the meta-populations theory, which states that local populations of a certain species can form a meta-population when there is some exchange of genes between the populations. If a meta-population is possible due to spontaneous migration, the populations are less isolated and the chances of survival of a population are larger. The models take into account habitat quality, effect of barriers and stepping stones and traits of species, such as dispersal distance, productivity and life span. 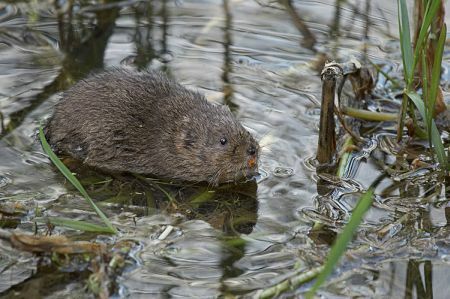 Identification of viable and non-viable populations of the European water vole in a wetland area in the United Kingdom. Key population areas and other populations are identified. Subsequently the model LARCH identifies viable and non-viable habitat and population networks. Based on the results non-viable populations may be connected via e.g. stepping stones to form viable meta-populations. The models have been applied multiple times in the River Rhine delta, the Wisla delta in Poland, the Scheldt delta in Belgium and the Amazon delta in Brazil. And on a different scale also applied in Israël, Ukraine, Russia, Sweden, Germany, Luxemburg, and the United Kingdom. 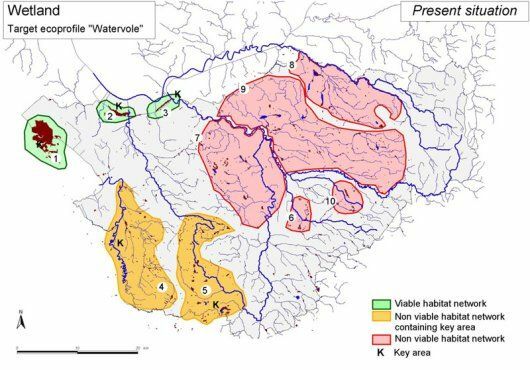 The four pictures below give several aspects of input: (a) carrying capacity and output; (b) populations; (c) viability, and (d) connectivity on the model LARCH applied for a part of the Wisla river in Poland to asses viability and connectivity on the Corncrake. 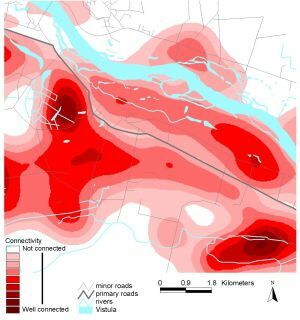 Figure d: this picture shows that the populations in the lower half have a better chance for survival and it also shows where potential improvements of the connectivity could be planned. 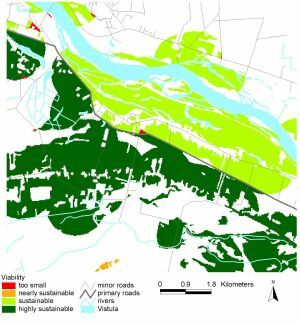 The model needs a vegetation map or land use map that has enough detail to distinguish the habitat and non-habitat areas for the modelled species. If the model is applied for new species, information on habitat preferences, life-cycle traits and dispersal capacity is needed. The user also has to have basic knowledge of the meta-population theory. The models can be applied from local scale till regional/national scale. LARCH can be used by scientists after some training; the MNP can only be used in cooperation with Alterra. Runs are normally performed for land owners, land managers and governments, and also for purely scientific research. LARCH has an installation file and a user guide and documentation, MNP has only model documentation.